The 2nd Preston Road Bankside Gallery Takeover – 22 derelict houses soon to be demolished will be transformed in the afternoon by more than 100 artists from around the UK. There will be food & drink and local DJs. 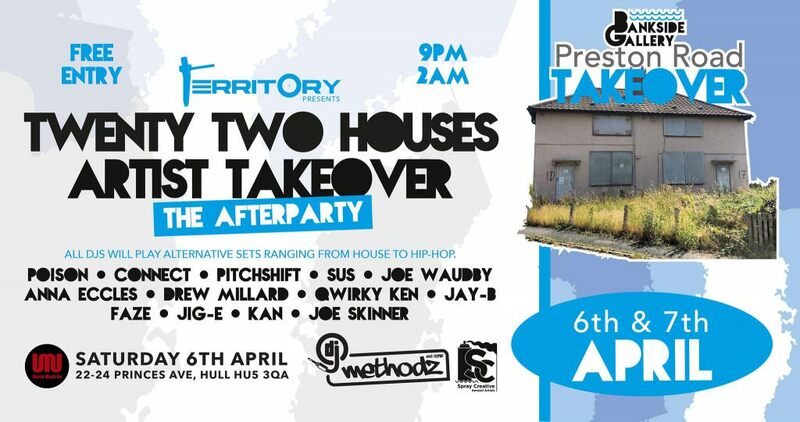 Following Territory’s hosting of the Drum & Bass tent, there will be a unique, free afterparty in the city centre featuring DJs from Hull and the surrounding areas, playing alternative sets ranging from house to hip-hop to reggae. You’re guaranteed to bump into someone you know, so come on down to Union Mash Up to be a part of the experience and hear The Territory Crew and their special guests spin a selection of chilled out beats, bass and breaks.